Welcome to Behind the Scenes week! In honor of closing weekend of Secret Identity Crisis, I’m writing a series of posts about what improvisors are up to behind the scenes — in rehearsal, preshow and backstage. “If you’re making it up on the spot, what do you do in rehearsals?” (or some version of that question) is one of the most often asked questions. The answer: it depends on the show. 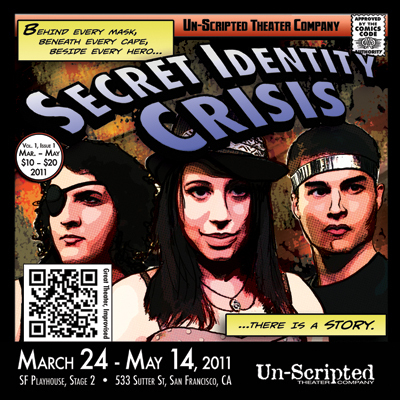 The Un-Scripted Theater Company follows a rather standard theater schedule of 6-8 weeks of rehearsal, then we open and have a run of shows for 4-8 weeks with rehearsals continuing through the run. There is a director (or co-directors) for each show who come up with the vision and design rehearsals to train the cast in the skills needed to make a successful show. In rehearsal, we worked with exploring the archetypes of the genre (the hero, the nemesis, the sidekick, the love interest and the mentor). By exploring them in rehearsal, we get through the easy references and common storylines so by the time we open we are ready to explore a wider variety of story arcs. We worked a lot on endowments; always critical for an improvisor, an endowment is something an improvisor says or does that provides color and specificity. It can be about the location (“I’ve never seen so many posters of bears in one room.” or “Watch your step, there’s a sudden drop into the abyss over there”) or your own character (“I’ve never told anyone this before, but after the accident I started to have psychic visions.”) or someone else’s character (“I love you even if you never let me see your face behind the mask.”) Since we perform on a basically empty, black stage, we need to create the set in our audiences mind and communicate with each other within the scenes all of the ideas in our head. We also practice the specific structural elements of a show. In Secret Identity Crisis, the show always starts with a climactic scene that ends with the main character in a spotlight. Then the story moves back in time and we work towards that moment for the rest of the show. And we practice specific skills, like stage fighting which is its own post later this week. Most importantly, the weeks of rehearsing together gives the cast time to know each others strengths and weaknesses and how to play together. There are 13 cast members, some of whom have played together for years and others who are totally new to each other. That’s a lot of playful relationships to develop. Rehearsal, for me, is an amazing time of growing appreciation for each persons’ skills. Once the shows open, there is focus on how to go farther, tell more sophisticated stories, bring in more skills and achieve our goal…which is that our audience on any given night leaves feeling not only satisfied with the superhero show they’ve seen but that they feel like they’ve seen a play that just happens to not have a script. Registration is open for my next series of Playtime for Parents classes. Thanks to the Recreation Department from the City of Albany for the opportunity to teach there! Enhance your enjoyment of playing with your kids by (re)discovering and deepening your own sense of play. Have fun exploring play with other parents, while learning practical hands-on ideas you can use with your family. The class will incorporate improvisation and storytelling techniques and explore how to use them with children of all ages. Each week will involve new games and activities. Four sessions. Register for individual sessions or receive a discount when you register for all four. City of Albany online registration is here. You can also register by phone by calling (510) 524-9283. Secret Identity Crisis is happening NOW! We’re already in week three of performances and tomorrow night is my first show. (There are 13 improvisors in the cast with 5 or 6 performing each night.) I’m very excited to be back on stage and creating improvised theater. Full details and ticket buying at www.un-scripted.com. If you want to come see me play…I’m in the shows on Sat April 9th, Thurs April 14, Thurs April 21, Thurs April 28th and Sat April 30th.